Pidgeon pea is a large shrumb to 2m, it is a short lived perennial growing for about 5 years before it dies. This plant produces large quantities of pods each filled with between 3 and 7 small seeds. The seeds can be removed from the pod and eaten raw while still green or the pods can be left on the plant to dry and the seeds collected as a dried pulse. In India the dry seeds are shelled and split and used to make Dhal, a popular dish. 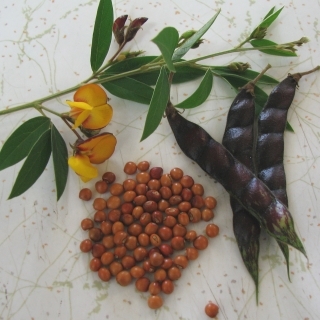 Pigeon pea is a vigorous grower and produces lots of material for adding bulk to compost heaps and can be cut back each year after the seeds are collected. The yellow and red pea flowers are also quite attractive and provide a nectar to beneficial insect pollinators. These bushes also make great windbreaks when planted along the outskirts of a garden. Both the seeds and the leaves make excellent food for chickens. This plant is well suited for tropical and sub-tropical climates and is best sown during Spring, Summer or Autumn. In temperate regions that receive frosts avoid Autumn sowing. Will crop well even on poor soils. Grow in full sun. Sow seed 2cm deep. Soak overnight in water to promote even germination. Seeds take between 2 and 3 weeks to germinate. The time before the first pods can be harvested is quite variable and can be anything from ten weeks up to a year, depending on the sowing time and growing conditions. Pigeon Pea flowers can be quite attractive in their own right.